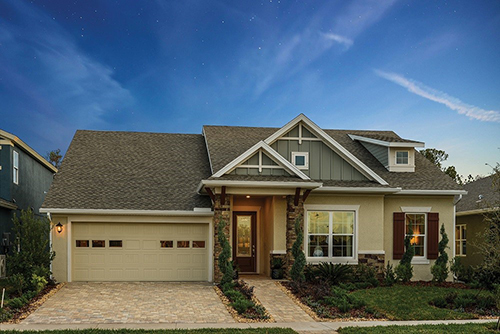 Tampa, FL (March 21, 2018): David Weekley Homes, the nation’s largest privately-held builder, was recognized at the 2018 Tampa Bay Parade of Homes. The award brings the company’s total to nearly 750 awards for product design and more than 1,200 overall. Chosen through the Tampa Bay Builders Association, the annual Parade of Homes showcases the best homes throughout the region. The Tangelo, Weekley’s model home in Bexley, was bestowed with the Silver Award in the $550,000 - $599,000 category. Priced from the $550s, homes are situated on 80-foot homesites with eight one- and two-story floor plans ranging from 3,700-4,500 square feet. Homes offer four or five bedrooms, three or four full baths and one or two half baths with three- or four-car garages. For more information about David Weekley Homes in Tampa, contact 866-493-3553. David Weekley Homes, founded in 1976, is headquartered in Houston and operates in 22 cities across the United States. David Weekley Homes was the first builder in the United States to be awarded the Triple Crown of American Home Building, an honor which includes “America’s Best Builder,” “National Housing Quality Award” and “National Builder of the Year.” Weekley has also appeared 12 times on FORTUNE magazine’s “100 Best Companies to Work For®” list. Since inception, David Weekley Homes has closed more than 80,000 homes. For more information about David Weekley Homes, visit the company’s website at www.davidweekleyhomes.com. The Tangelo, David Weekley’s model home in Bexley, received an award at this year’s Tampa Bay Parade of Homes.